HMH Books for Young Readers, 9780544332171, 256pp. 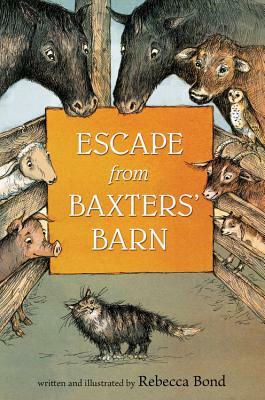 When Burdock the barn cat sneaks into the Baxters’ farmhouse kitchen to hide behind a warm stove, he overhears a sinister plot that endangers all the animals on the farm. It’s up to him and his cacophonous cohorts to figure out how to bust out of the barn before it's too late. In this winning debut, readers will fall in love with the solitary cat, the self-effacing cow, the unstoppable pig, even a wayward she-owl—all brought to life with clever dialogue, poetic descriptions, and expressive black-and-white illustrations. This warm, lively read-aloud story about teamwork and friendship has the timeless appeal of a much-loved quilt.